Yesterday, Jon Gordon (the host of Future Tense, a technology show aired by American Public Media) discussed the major tech innovations of the decade. At the end of the show (around the 49th minute), a caller asked: "What's the neatest site, in terms of wow factor, that makes you say holy cow this is so cool?" And, in answer, Jon responded: Open Culture. We're not cutting edge. We're under-read and under-appreciated. (All probably true -- any thoughts on how to fix that?). But we deliver the goods. Thanks very much Jon, and thanks for allowing me the rare self-pat on the back. You can listen to the interview below or access it here. And, if you want, you can follow us on Twitter and Facebook and get updated on all new bits of Open Culture. Couldn't let you down. Couldn't let the year end without giving you a "best of" list. So here it goes. A purely subjective list. 25 items. Some educational; some a little more entertaining; some popular, etc. I hope you enjoy, and you can always search through our complete archive here. Thanks all, and best wishes in '10. How a Bach Canon Works. Brilliant. Yup, we mentioned Quentin Tarantino last week, and we're doing it again this week because Rosario has unearthed this nice clip. In six snappy minutes, Tarantino (director of Pulp Fiction, Reservoir Dog, Inglorious Basterds, etc) lists his favorites films made since 1992 -- when he, himself, started making films. You'll know some of these titles, but likely not others. Today, we're rolling out a sizable collection of Free eBooks, most of them classics, that features major works written by James Joyce, F. Scott Fitzgerald, Jane Austen, Nietzsche and others. (We have even thrown in a little Paulo Coelho.) You'll find 100+ free ebooks in total, and you can download the texts to your computer, smart phone (iPhone, Android, etc.) or Kindle, depending on the format you choose. Our eBooks Primer overviews the different download options, so please give it a quick read over. Below, we've posted a quick sample from the new collection (plus a link to the entire list of Free eBooks). Feel free to offer feedback and share the list with friends. Down the road, you can always find this collection in the top navigation bar. Just looks for eBooks. Note: Don't forget to check in on Seth Harwood's big Kindle experiment. What happens when you sell your book for 99 cents on the Kindle? Find out as the experiment unfolds. Story here. Disney Kindle Commando Sunday is Here! About a week ago, I posted here about my Publishing Experiment Take 1. I spoke of the need for authors (Yes, Authors!) to make experiments in new media and publishing. Well, now's the time to put my fiction where my mouth is. 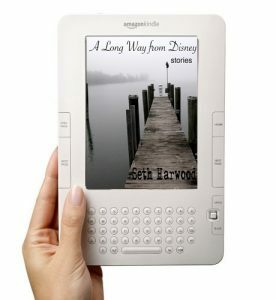 Today I'm launching my collection of short stories, A Long Way from Disney, on Amazon's Kindle platform at the price of $.99. Direct link to buy A Long Way from Disney on Amazon. Please visit SethHarwood.com/kindle for more info. You can buy the book if you have 1) A Kindle 2) an iPhone/iPod Touch or 3) Any PC computer! Easy! See you soon with more free stories and results from this experiment. PS: If you'd like to hear more free stories like this, you can check out new posts today at CrimeWAV.com and SethHarwood.com. You can also get the stories directly from iTunes. Seth Harwood podcasts his ideas on the publishing industry and his fiction for free at sethharwood.com. He will be teaching an online course (The Essential Art: Making Movies in Your Reader’s Mind) with Stanford Continuing Studies starting in January. His first novel, JACK WAKES UP, is in stores now. One thing is for sure. David Lynch has never been conventional. Not now, and not during his early years. While putting together our collection of Free Movies Online, we unearthed several short films from the 1960s, when Lynch was getting his start. His very first film, Six Men Getting Sick (Six Times), appears above. Links to the others can be found below. A DVD containing these and other early Lynch films can be bought on Amazon here. You can find these and other great films in our collection of Free Movies Online. It now features more than 130 movies by Hitchcock, Kurosawa, Capra, Coppola, Scorsese, Tarantino and more.